Amidst continuing talks between Iran and Iraq over how to settle payments for Iraq's natural gas imports from Iran in the face of Washington sanctions, Iranian officials are mulling over Iraq's offer to pay in Iraqi Dinars instead of the dollar or Euro, according to Iranian state media. This follows the September announcement by Iran that it planned to completely ditch the dollar as a currency used by the two countries in the trade transactions. Iraq was among countries granted a temporary exemption as energy sanctions on its eastern neighbor and regional Shia ally took effect November 5, and since then Baghdad has pushed to process payments for gas and electricity in its own currency of dinars. Iraq is Iran's second largest export market with a substantial portion of that trade in energy, which cannot cannot easily be structured outside the new sanctions regime. Baghdad has found itself in the delicate position as a partner of both Washington and Tehran — largely reliant on the former for defense and on the latter for gas and power generation, keeping its economy afloat. Last summer a severe temporary electricity reduction fueled unrest across the south of Iraq. Chronic shortages and a failing Iraqi infrastructure means Tehran has been a key lifeline fueling Iraq's increasingly desperate needs. Iranian officials have also recently declared "Iraq is one of our successes" and a "strategic ally" as echoed in a weekend televised broadcast featuring the head of Iran's Islamic Shura Council, Hossein Amirabedhaleyan. However, as the head of the Iran-Iraq Chamber of Commerce Yahya Ale-Eshagh stated before the latest round of sanctions took effect: “Resolving the banking system problem must be a priority for both Iran and Iraq, as the two countries have at least $8 billion in transactions in the worst times,” according to a September statement. 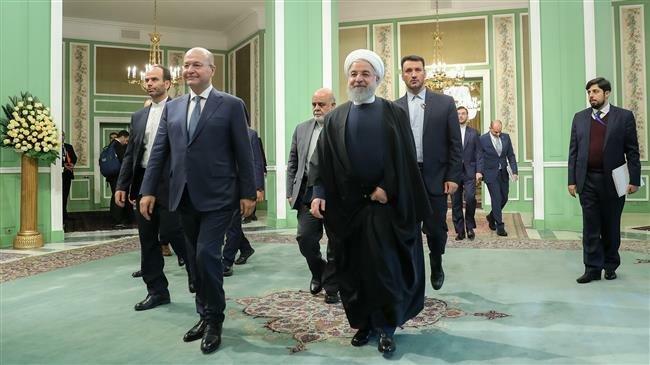 Meanwhile on Monday Iran's leadership continued making dubious promises that energy exports will defy all expectations and thrive, with President Hassan Rouhani saying US sanctions are "part of a psychological war doomed to failure". “They have failed to stop our oil exports. We will keep exporting it... Your regional policies have failed and you blame Iran for that failure from Afghanistan to Yemen and Syria,” he added as the crowd he addressed in the city of Khoy chanted “Death to America!”. Iranian officials have vowed to stick by the 2015 Iran nuclear deal in spite of Washington's aggressive attempts to dismantle it. Foreign Ministry spokesman Bahram Qasemi expressed to reporters he is “hopeful that the Europeans can save the deal” in reference to the EU's attempts to establish a Special Purpose Vehicle (SPV) for non-dollar trade with Iran. European and other foreign business, however, have still been leaving Iran in droves out of fear of US penalties. Iran’s Ambassador Iraj Masjedi announced over the weekend amidst the high level talks involving Iraq's President Barham Salih: “Considering the problems that have emerged in dollar-based banking transactions, a joint proposal between Iran and Iraq is using Iraq’s dinar in trade,” according to Iranian state media. He added that an alternative plan might included using barter mechanisms to carry out imports and exports with Iraq.